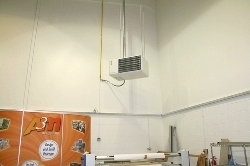 As Main Contractor on any project, Hampshire Mezzanine Floor will take care of the mechanical installation for you, which include air conditioning, refrigerant, ventilation and heating systems. Hampshire Mezzanine Floor will design and install your equipment and also maintain your equipment after installation. ..or please get in touch with us for more information and to request a free quotation.